Since opening it’s doors in 1983, Humanscale has built a solid reputation as a design and innovation leader. Along the way they have amassed an impressive trophy collection. These achievements have been as a simple by-product of their mission to develop high-performance ergonomic office tools that solve functional problems as simply and elegantly as possible. 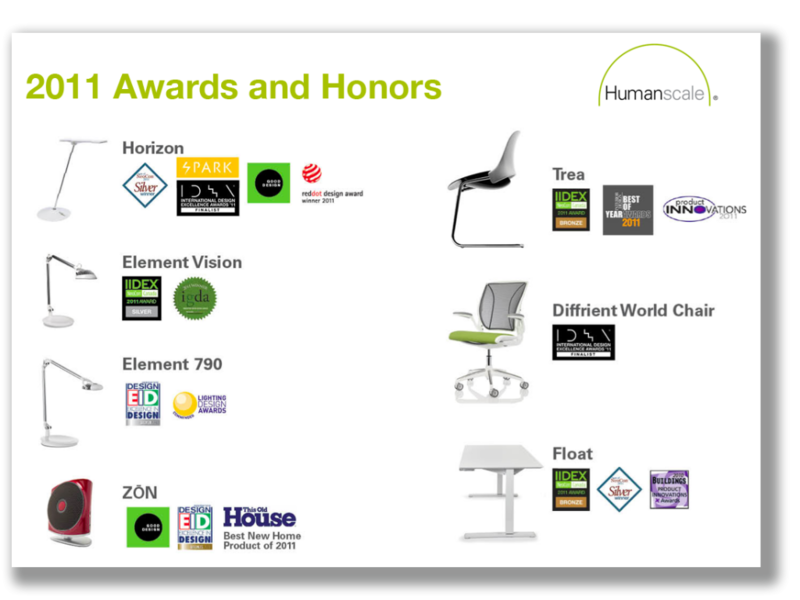 International design accolades have continued to stream in and to date Humanscale have been accredited with over 100 international design awards ranging from task seating to task lighting and more recently, personal air purifiers. A list of 2011 Awards and Honors is listed below - the highlight of which must certainly be Humanscale’s Red Dot Design Award for the second consecutive year. Following the Diffrient World Chair in 2010, the Horizon Task Light has been honored with the prestigious Red Dot Award for Product Design – selected among the category’s 4,433 entries from 60 countries, for its innovation, function and visual aesthetic.